Incorporated June 25th in the year 1700, Framingham, in the year 2000 celebrates its Tercentennial, 300 years as a town in the Commonwealth of Massachusetts. 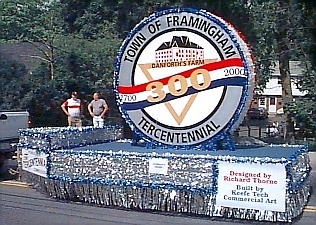 The Framingham Tercentennial Commission's float in the 1999 Flag Day parade, featuring Tercentennial logo design by Richard Thorne. The float was constructed by students at Keefe Tech, a regional vocational high school located in Framingham. Framingham Tercentennial Celebration Events - updated info on planned events; parades, country fairs, concerts and more! Civil War Encampment Weekend - April 28, 29, 30, 2000 - Framingham Centre Common. Re-enactors in period uniforms will celebrate Framingham's rich Civil War history. Framingham's Civil War Flag - "Rally 'Round the Flag", efforts are underway to restore this flag carried by Massachusetts 13th Regiment soldiers and given to the Town in 1873. Volunteer Planning Information - volunteer to help with Country Fair 2000! Vendor/Booth Information - vendor booth space info and pricing. Booth Application Form - printable booth application. Booth License - sample of license agreement, please read if applying for booth. Directions to Fairgrounds - and parking information. List of Exhibitors - organizations, local merchants, craftspeople and vendors. Tercentennial Memorabilia: - mugs, pins, prints, coverlets, t-shirts and other Framingham Tercentennial memorabilia are available now! Student Wins Tercentennial Logo Contest!